On the 14th March six university teams of hospitality students took up the HOTS challenge as part of the annual Passsion4Hospitality event hosted by the Institute of Hospitality. The HOTS Business Game consists of a competition to successfully operate a 200- bedroom hotel simulation, setting up rates, revenue and marketing strategies. A special mention must go to Jovanie Tuguinay, a final-year student at Blue Mountains International Hotel Management School, near Sydney, who completed the preliminary heats by Skype and then travelled from Australia to London to take part in the final. The other teams came from Manchester Metropolitan University, Bournemouth University, Plymouth University, Sheffield Hallam University and the University of Brighton. 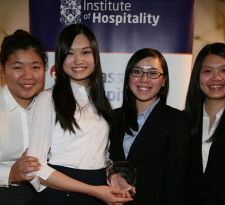 The team from Plymouth University ( pictured left to right: (Julia Lau, Sammi Cheung, Kimmy Yuen, Kirsty Chiu) achieved the highest level of profitability and REVPAR and was declared the winner. Passion4Hospitality 2016 was sponsored by Fresh Montgomery, Harbour & Jones, Acquire Services, Accor Hotels, Arena4Finance, HOTS, Bartlett Mitchell, Corinthia Hotels, The Savoy Educational Trust and the Council for Hospitality Management Education. The HOTS Business Game was administered by Mike James of the Russell Partnership and Debra Adams FIH of Arena4Finance.